As Indian cities invest in information technology services, minimum standards should require the use of visualization tools to better utilize transport data and improve bus planning. Photo by EMBARQ. Over the past decade, many transit agencies in Indian cities have implemented information technology services (ITS) to improve bus planning and operations in urban areas. These typically require huge investments financed either by the city government or by the transit agency alone. However, using such technologies alone does not guarantee tangible improvements in level of service. Without the appropriate analytic tools to analyze transit data, technology implementation results in the mere procurement of hardware that generates a huge amount of data without supporting any real decision-making. Minimum standards must be created that require transit agencies to use various analytic methods and create easy-to-read operational reports that can be generated from this rich data as part of the technology procurement process. Better visualizations and analytic tools can make use of valuable transit data to provide a wide range of insights for transit agencies – from whether buses are arriving on time to which bus stations are used most – improving transport planning and the user experience. While these reports seem important, the format in which they present data makes it difficult to draw any conclusions from them. For example, one day’s harsh breaking report generated from the AVLS system in Mysore ran hundreds of pages. Similarly, the schedule adherence report for a single day is 130 pages, a sample of which is shown below. This sample extract from a schedule adherence report shows that despite the information’s importance, the report’s format makes it difficult for transport planners to draw any conclusions. Image from Mysore ITS Report 2013/EMBARQ India. Further, the system generates reports on issues of little use for urban transit planning. For example, it generates speed violation and route deviation reports, despite the fact that buses operate on extremely congested roads, and there is not much possibility of a driver deviating from his or her route while carrying passengers. Currently, the only practical use of AVLS’s in public transport in Indian cities is passenger information systems that display the anticipated arrival time of the next bus at a stop. However, there has not been any research on the accuracy of these systems. Similarly, data from electronic ticketing machines is often only used for daily earnings and passenger count reports, despite their vast potential. The use of simple visualization techniques using data generated by ITS can transform these monotonous reports into powerful tools for transit managers. EMBARQ India’s Bus Karo 2.0 report provides examples of visualizations developed from AVLS and electronic ticketing data that can improve planning by answering key planning questions. By representing schedule adherence report data in a graph comparing time of day and bus stops, an entire day’s worth of data for a bus can be shown in a single image, as shown below. The yellow line shows where buses should be located at a given time, represented by cumulative distance traveled (route chainage). The gray line clearly shows where a bus driver deviates from his or her schedule. 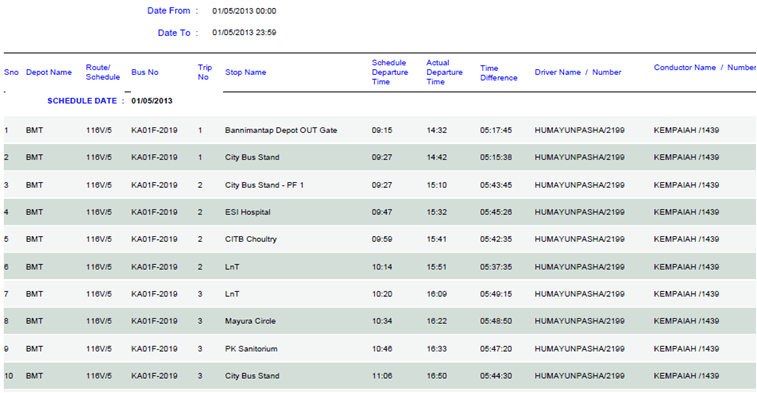 This bus schedule adherence report visualization from Bhubaneshwar can show the reliability of individual bus drivers. Graphic by EMBARQ India. This data could also be translated into a quantitative measure, which would enable a transit manager to rank each driver and identify the best and worst performers. This information can be used to implement a rewards and penalties incentive system to encourage drivers to adhere to the schedule. Using the same AVLS data from all buses on a particular route, a simple graphical representation of arrival patterns can be created to understand the reliability of the transit service. The graphic below shows the variation in times between buses arriving at a particular stop – known as “headway.” The yellow line shows that buses are scheduled to arrive at consistent intervals, though the gray lines show that the time between bus arrivals varies. This headway analysis report from a stop in Bhubaneswar shows the inconsistency of bus arrivals. In a scenario where the planned arrival time is consistent throughout the day, a standard deviation of zero would correspond to total reliability. Graphic by EMBARQ India. Which bus stops do passengers use most? Just like AVLS data, ticketing data from electronic ticketing machines can also be used to develop graphics that improve transit planning. For example, the data can be used to map ridership and boarding and alighting (disembarking) patterns at each bus stop, as shown in the graphics below. 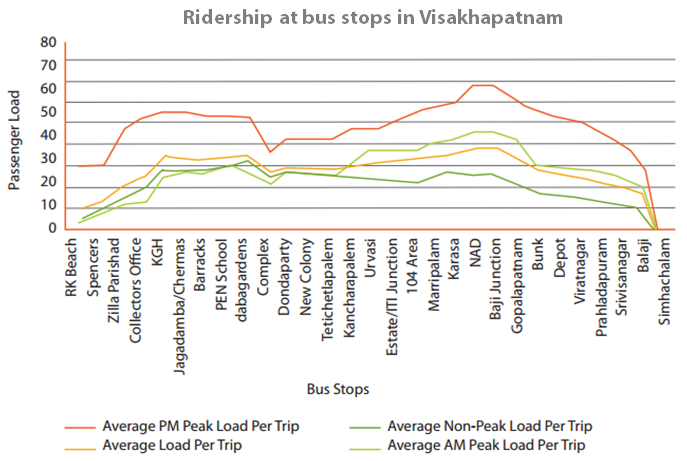 This graphic shows ridership at each stop – called the “load curve” – created from electronic ticketing machine data in Visakhapatnam. Graphic by EMBARQ India. This boarding and alighting (disembarking) visualization is created from data collected in Bangalore. Graphic by EMBARQ India. ITS are of no practical use unless combined with visual and analytical tools that process the data generated to help understand performance and evaluate the effectiveness of a particular route or the transit system as a whole. This potential has not yet been reached in any of the cases where ITS are being used in Indian cities. Developing a manual on the minimum standards for data visualizations and analytics from transit data could make it easy for transit agencies to include these deliverables as part of ITS procurement, thus making effective use of the enormous sums of money spent on ITS technology. Learn more about visualization and transit management in EMBARQ India’s Bus Karo 2.0 report.